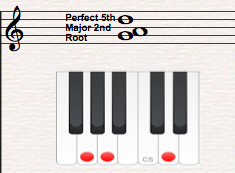 Chord theory is a musician’s best friend. Now, why exactly is that? It’s because it’s a system that helps you understand what chords you need to use in a given song. It also helps when playing whatever style of music you might encounter. Fortunately, the piano is a very visual instrument. This makes it very easy for us to understand how chord theory works. Have you ever wondered what those chord symbols really are? Here we now discuss how to read and play those chord symbols. I’m going to tell you a huge shortcut right now. 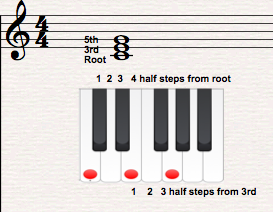 Remember the first scale that most people learn called the major scale? Guess what, 95% of the chords you learn will use this easy scale as a building block! Whenever we describe chord names and chord theory, it’s always in reference to a major scale. 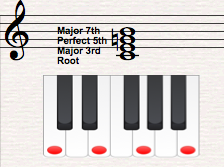 So, if you want to understand those crazy chord names, know your major scale: it forms the basis for our chord theory. 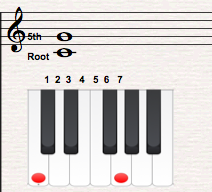 …is a seven-note array of notes. …starts with a note we call the “root”. 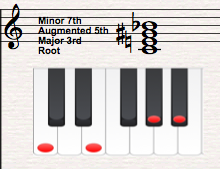 To breeze through chord theory, we need to name all the seven notes of the major scale in the following order. We will call these names the scale degrees. If you want a deeper understanding of major scales, go on and read Major Piano Scales: Awesome Mastery Tutorial and/or Piano Major Scales: How To Build and Play Them in Any Key. Now that you understand the basics of the major scale, let’s use it to start learning all those sweet chords! A lot of people make chords more complicated than they need to be. Here’s an easy to think about chords going forward. Simply put, it’s just a combo of two notes or more put together. The smallest chord you can get is called a power chord. Power chords are nothing more than the root and the perfect 5th played together. 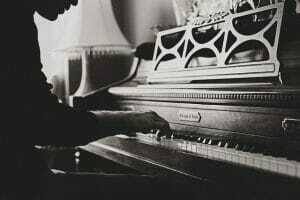 To play a power chord on the piano, play any note plus another note seven half steps away from it. Power chords are “neutral” sounding in quality i.e. neither “happy” or “sad”. The perfect 5th thickens the sound of the root note. When you’re playing something heavy or ballsy like hard rock, punk, or metal, power chords are the way to go. Now that you understand the basics of 2 note chords, lets talk about 3 note chords. A 3 note chord is often called a triad. 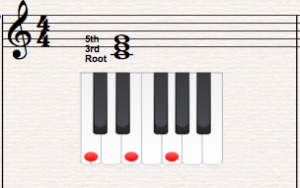 VERY IMPORTANT: We spell chords to always represent a root + third + fifth relationship. What I mean to say is when you spell out your chord, it has to appear that you’re skipping letters of the alphabet. For example, although Gb, A#, and Db sounds as a Gb major chord, the correct spelling of the chord is Gb, Bb, and Db (Gb to A# is an augmented 2nd while Gb to Bb is a major 3rd, even though they will sound the same on the piano). Want to sound happy and bright? Major chords are the way to go! As an example of major chords being used in actual songs, check out this neat Amazing Grace piano lesson. Minor chords have that “sad” or “dark” quality. This Let It Be Piano Chords lesson shows how using a minor chord can add tension or contrast to start a new song section. If you want to add a little bit of tension, uneasiness, or even try and spook someone out in your music, diminished chords are your go-to chords. For an example of how to use a diminished chord, check out this lesson on Plush Chords by the Stone Temple Pilots. If you want to take people away into feelings of dreams, fantasy, flights of mystery and wonder, augmented chords are the key. An augmented triad has a root, a major 3rd (four half steps away from the root), and an augmented 5th (four half steps away from the major 3rd). Major seventh chords are what most people think of when they say “jazzy”. These chords are kind of like a happy or bright sound with an added element of “cool” or “relaxation” feel to it. 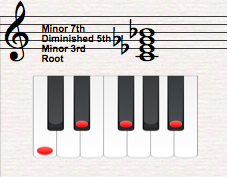 Minor seventh chords have that sad minor blues or jazzy sounding effect. It is a chord that typically leads or transitions to the first chord in a particular key signature e.g. G7 naturally leads to either C or Cmin (or any variation of it). In chord theory, it is a pivot chord i.e. 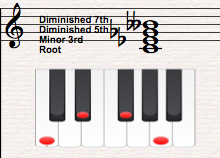 a series of dominant seventh chords (called secondary dominants) can be used to change key signatures e.g. G7 then C7 then F or Fmaj7 (the first chord in the key of F). They are the blues chords. Most blues songs consist entirely of dominant seventh chords. 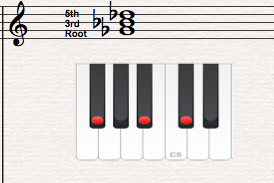 Dominant seventh chords do a really good job of linking from one chord to the next. I even once heard that John Williams (yes, the famous Hollywood film composer) uses them like you would use “and” in a sentence! Because of its nature as a chord that would typically lead to the first chord of a key signature, the dominant seventh chord has that “hanging” feel to it. In this Hallelujah Piano lesson, watch out how that E7 chord leads nicely to an Am chord. Also known as a “half diminished” chord, It has a kind of “unsettled” feel that easily leads to a dominant seventh chord. This kind of minor chord has kind of a “dark” yet “jazzy” feel to it. Remember, you can’t call Bbb as A, although they are enharmonic, because of chord theory naming conventions. A diminished seventh chord has that really unsettling feel that makes your ears look for a more consonant sounding chord to go to next. 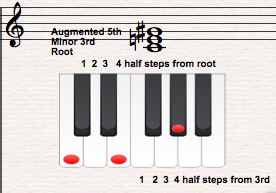 Augmented seventh chords have that “dreamy” yet “unsettled” quality as well. 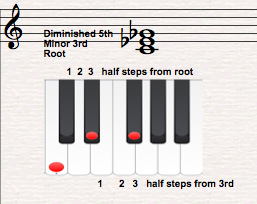 Most jazz musicians call this chord a dominant 7th flat 13 chord instead i.e. this example shows a C7(b13). From a technical chord theory standpoint, this is one of the most consonant sounding chords you can hear. Suspended chords have a kind of “hanging” feel to them; they always resolve to a triad. We usually play these chords just right before a dominant seventh chord. Chord names can sometimes get very confusing. I know. I’ve been there. So, how do we actually name chords? 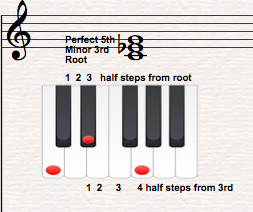 A plain major triad is named is simply named after the root note e.g. C is simply C + E + G, D is D + F# + A. 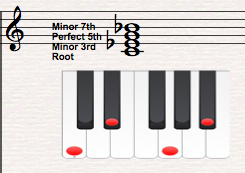 A plain minor triad will have the triad quality “m” or “min” attached to it e.g. Cmin or Cm is C + Eb + G.
A “dim” or “°” sign attached to a note letter name means the chord is diminished. For example, Cdim or C° means the chord is C + Eb + Gb. An “aug” or “+” sign attached to a note letter name means the chord is augmented. For example, Caug or C+ means C + E + G#. 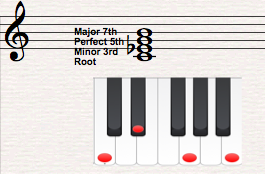 A tag “maj7” attached to any chord name (whether major or minor) means that there is a major 7th (11 half steps) away from the root added to the triad. For example, Cmaj7 is C + E + G + B (major 7th from C). Cmin(maj7) is C + Eb + G +B. A plain “7” attached to any chord name (whether major or minor) means a minor or a flattened 7th is attached to the triad. A “sus” tag means the chord is a suspended chord. It is usually sus4. Otherwise, sus4 or sus2 would be written out to be more specific. Other extensions that might be added include numbers higher than 8 in parenthesis like 9 (a 9th away from the root note), 11, and 13. These numbers can also be given accidentals right before them meaning that they’re either sharp or flat. 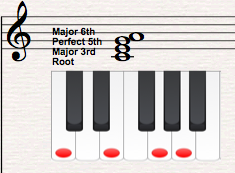 To easily find out the chords that would naturally exist in a given key signature or scale, you can draw a chart with at least three rows as shown below. This is a way of making chord theory a whole lot easier. First row has the notes of the scale starting at the root note. Second row has the notes of the scale starting at the third note of the scale. Third row has the notes of the scale starting at the fifth note of the scale. After you draw your table correctly, you can find out the kind of chords charted by playing them and/or using the chord theory formulas you have just read about i.e. how to form a major chord, etc. 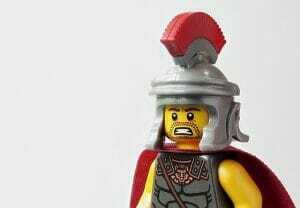 Now you might ask, “What are all those Roman numerals?”. Those Roman numerals are our chord names in scale degrees. This is what most musicians refer to when they talk of things like the “I” chord, “ii” chord, etc. Roman numerals in uppercase have major 3rds from the root and those in lowercase are chords that have a minor 3rd from the root. 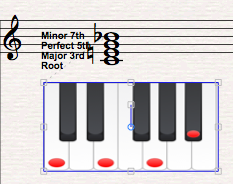 Uppercase chords that have a “+” are augmented chords, and those that have a “o” sign are diminished chords. Check out this neat lesson about piano chord progressions: I, IV, V, IV to get a hang of how we use Roman numerals to refer to chords. What’s In It for Me To Learn Chord Theory This Way? You will instantaneously know what chords sound good in songs. 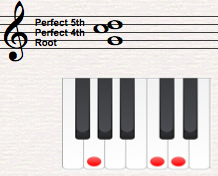 You’ll be able to predict what chords to expect in songs in any key signature. You can easily learn new songs when you know where certain chords fit. The next step is checking out how to play these chords more effectively. Go ahead and try out our chord inversions lesson. I hope that this guide has brought you closer to understanding chords and how to actually use them in various examples. If you enjoyed this lesson, have questions, or any comments about it, please leave a comment below. For more awesome piano lessons that go straight into your inbox, go ahead and subscribe to the pianolessonsonline.com free mailing list. Go to the upper right hand corner of this page and fill in your name and email to sign up. It’s that easy! I’m sure that you won’t regret it. Happy music making, folks! Thanks!